Every 20 seconds of every working day, the U.S. Government issues a contract for support of defense and civilian initiatives, in particular, mission critical programs. This makes the U.S. Government the largest marketplace in the world and a great opportunity for business. The information on government contracting is plentiful, but sifting through extraneous information to find exactly what is needed is an arduous task. To ease the information gathering process, assembled is as much pertinent information as possible to help obtain resources and avoid some of the pitfalls, time, money and frustration commonly experienced in government contracting. This guide has been used by government contractors, contracting officers, as resource material for university curriculums, and others. It has been featured in national newspapers and magazines. 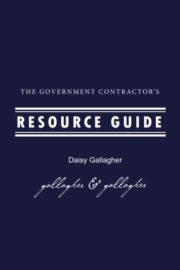 “I had one goal in mind when the first edition came out back in 2006, to produce an easy to use guide which incorporated lessons learned and resources gathered from my research and almost two decades of experience as a government contractor.” states Gallagher, “When I first started out, like many others new to government contracting it seemed unfathomable that a business – never mind a small business – could penetrate the walls of government contracting. After many years of attending workshops, expos, training, and conducting outreach for the government all the while using my own marketing research background, I managed to harvest the key materials located throughout countless websites, books, handouts and documents, policies and procedures. I incorporated into The Government Contractor’s Resource Guide what I believe to be among the most relevant of this information, compiled into an affordable easy to use resource guide.” The Guide contains information helpful for business going after new contracts and serves as a quick reference for procurement and contracting officers when contracting with business. “From the time the first edition was first published testimonials keep pouring in” says Gallagher, “The testimonials on The Guide’s usefulness range from a former U.S. government agency head overseeing small business contracting hailing it as one of the most comprehensive easy to use guides she has ever seen in or out of government, all the way to contractors’ testimonials – even those with years of experience – expressing its usefulness especially with contact names, phone numbers and useful websites, samples of teaming agreements and even definitions of acronyms used everyday inside government. “One of the greatest moments for me is when agency contracting officers and project managers – especially those who have transferred over from the private sector to public sector and are still in the training process or simply do not have the time to be assembling all of the many resource information – tell us how useful the Guide has been to them.” states Gallagher. “Having the Guide at their fingertips when contracting out ultimately helps businesses, especially small businesses in getting an equal playing field.” “Nothing is more costly than plunging into the sea of unknowns of government contracting with little or no information or with so much information it seems overwhelming.” she concludes. The Government Resource Guide helps the reader decipher what to do and what not to do – at the same time providing them with additional tools to continue training, marketing and networking such as where to attend FREE workshops and other valuable resources. Daisy Gallagher is a leading expert in her field, with two decades under her belt as an award winning government contractor and highly respected business leader.